The first time I tasted a hot pepper mead, I was a judge for the Mazer Cup. Americas only (and by default) most prestigious, mead competition. Back then, judging happened in someone’s home – sitting around tables in the dining room and the kitchen. We were down to the oddities that didn’t fit into the other categories, the last of the day, and out comes this jalapeño mead. This mead was nothing but hot, wet, green jalapeño hotness. Imagine crunching down on the fattest, juiciest, raw jalapeño you’ve ever seen, just stuffing the whole thing in your mouth, that’s what this mead was like. Today’s mead makers are bringing more finesse to the table, mixing flavor with fire. Hot pepper meads are coming into their own. For this margarita, I’m using Hot Shot from Brothers Drake. This is a traditional mead infused with habeñero peppers. It’s potent enough to heat up a margarita without watering it down, and the citrusy, smoky chili flavor compliments the other elements of the drink. I went with Lunazul Reposado for the tequila. A very respectable, 100% agave tequila with a price point that makes it a great candidate for cocktails. This tequila is a delightful sipper on its own. Full bodied and very pleasant, it highlights the flavor of the hot pepper mead. Cointreau, triple sec, Grand Mariner, I looked at the bottles of orange liqueur on the shelf. I don’t like to over complicate my recipes, but I decided orange just wasn’t going to work with the Hot Shot. Instead, I chose a peach liqueur. The fuzzy, sweet, soft peach flavor sits comfortably with the barrel aged tequila and habañero warmth. Combine ingredients with ice and shake. Serve over ice in a salt rimmed glass. You can find Hot Shot in Ohio. Outside of Ohio Look here for hot pepper mead. 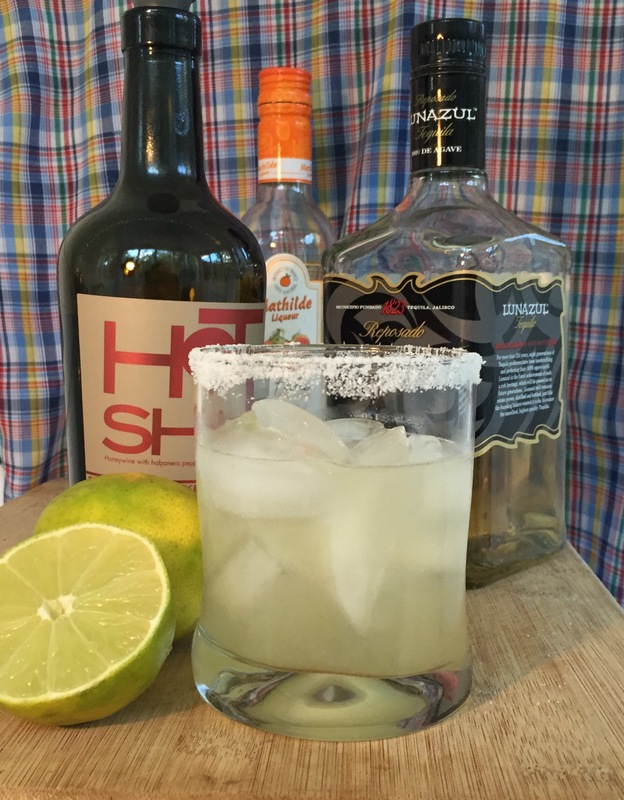 This entry was posted in Cocktails, Margarita, Mead, Tequila on August 17, 2015 by meadmixologist.